FourTrack now supports the new GuitarJack interface. Sonoma Wire Works has released the fourth version of FourTrack, its popular iOS multitrack recording app. This adds a number of features, including support for GuitarJack, Sonoma's new iPhone/iPod touch audio interface. - File Import: Import audio into FourTrack by opening an audio email attachment or by dragging audio files into FourTrack's File Sharing area under Apps in iTunes. Supports wav, mp3 and aiff formats. FourTrack's Sessions folder can now be dragged out of iTunes to the desktop. These features require iOS 4.0 and iTunes 9.2 or above. - AudioCopy: Copy a track or a mix in FourTrack. Name a copy to easily identify it in the AudioCopy history list of up to 12 items which includes audio previews. Paste to another track in FourTrack, to another song in FourTrack, to any AudioPaste enabled app, and to apps that support Apple's general pasteboard. - Input Monitoring: Use FourTrack's settings tool to enable/disable input monitoring. Input monitoring is enabled when a track is armed and in either Pause or Record mode. Playback of existing tracks overrides input monitoring. When input monitoring is on, sliders on armed tracks are enabled and control the monitor mix. - GuitarJack Control Panel: Adjust the input settings of the new GuitarJack audio accessory for compatible iOS devices. Select from 1/4", stereo 1/8" or both inputs simultaneously, and adjust input levels with 60dB of analog gain control. FourTrack remembers GuitarJack settings. Settings are maintained by the GuitarJack while powered, and it can be used by most apps that do recording or playback such as tuners, amp models, and more. When a stereo mode is selected, tracks will arm in pairs (1&2 or 3&4). - TaylorEQ: Sonoma Wire Works teamed with Taylor Guitars to create an input EQ for enhancing the FourTrack recordings of Taylor Guitars or any acoustic guitar. Select from a range of Taylor body styles in basic mode, or select the Advanced tab to adjust the 6 band parametric equalizer manually. - ARM Optimized Audio Engine: Hand optimized assembly code makes this the fastest running FourTrack release ever. - Higher Resolution Graphics: Optimized for the iPhone 4 Retina Display. The update is free for existing users, and FourTrack 4.0 is available to buy for £4.99 from the App Store. 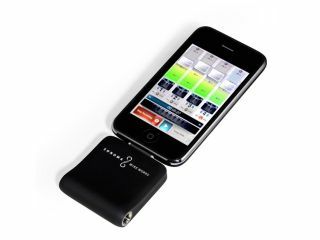 GuitarJack is also available now priced at $199, though you should be aware that the first version of the hardware isn't compatible with the iPhone 4, iPad or fourth generation iPod touch.